Our double walled stainless steel chimney systems are certified for use with wood, oil, gas, and coal. We offer everything from complete kits to a variety of individual components. All stainless steel chimneys and individual parts are double-walled with ceramic fiber insulation and come with a 25-year warranty. 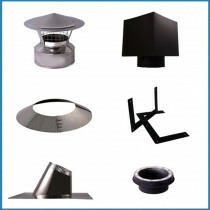 As a manufacturer, we have many years of experience with chimneys. We place a strong emphasis on customer service and consulting, and the manufacturing of high-quality parts. We would be pleased to support you on the planning and installation of your new chimney system. 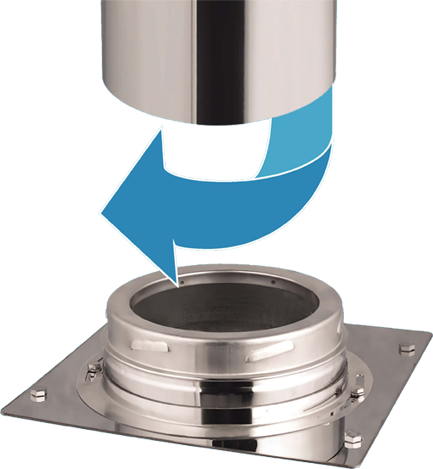 The Twist-Lock system is designed to provide stainless steel chimneys with additional stability. The “Jam Jar Lock” allows for easy installation with simple twist together components, resulting in a rigid and secure chimney. Even the most novice of DIYers wont't have a problem with precise installation. 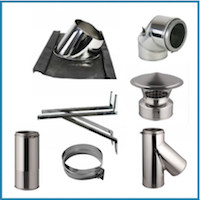 Stainless steel chimney systems differ from a classic chimney kit in their material. While the conventional chimney is brick-built, the stainless steel chimney is made of high-quality stainless steel. The use of this material prevents flue gas condensation already inside the chimney. Stainless steel chimney systems fulfill the same purpose as classic chimney: discharge of flue gas. Compared to a brick chimney, stainless steel chimneys are stacked or twisted together, making installation easier. Flue gas removal is necessary for any fireplace or stove, as a flammable buildup is possible if the chimney is not properly vented. Unlike traditional brick fireplaces, stainless steel chimneys are subject to certain requirements, and only when these requirements are met are they able to installed and used for residential and commercial needs. Chimney CC's stainless steel chimneys are certified to show that these requirements are met, and sustain a high-level of production quality. We back this up with a 25-year warranty. The classical chimney system can be traced back to the ancient Romans. They already built chimneys from bricks and similar material. The stainless steel chimney is a further development of the traditional brick chimney. In today's world, interested buyers have a much more varied choice of materials. Generally, one can choose between single-walled and double-walled. Also, the diameter of the stainless steel chimney will vary. The decision is based on the conditions of the application area for the future use of the fireplace. This inner diameter from the stainless steel chimney depends on your fireplace. If several fireplaces are connected to a chimney, usually a diameter that is larger than that of your fireplace is used. If the installation of the fireplace is planned for the outside, the chimney kit should be double-walled. A double wall protects the stainless steel chimney from external environmental influences. In addition, an insulating layer ensures the function of the fireplace. 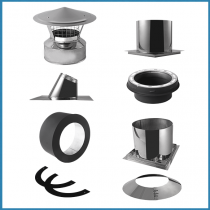 Unlike other chimneys, our Double Wall Chimney Kit with twist-lock connections come with some significant advantages. Therefore, consumer interest in this type of chimney is growing. The interlocking screws (jam jar principle) make the assembly of the individual elements extremely easy. All common firing materials can be used for burning in the fireplace. This flexibility allows individual planning in the use of wood, oil and gas. A significant advantage of the stainless steel chimney is the extremely low residue of the combustion process. In addition, the material of the fireplace is particularly resistant to the so-called derotation. The material is particularly conductive. 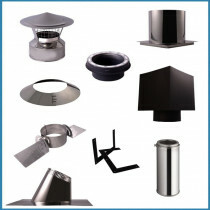 External influences such as drought and moisture can not affect the stainless steel chimney kit. Regular maintenance and maintenance of the chimney system and the stainless steel chimney straight lengths promote a long service life and particularly strengthen the corrosion resistance of the chimney. A modular system consisting of modular components enables the user to build an assembly tailored to his or her initial situation. Overall the assembly is very simple. Installing a stainless steel chimney takes very little effort for the customer. The stainless steel chimney kit contains several parts that are stacked on top of one another. The breakthrough of the wall is essential for assembly: the entire professional instalation is reliant on it. Whether a roof penetration is required for your stainless steel chimney depends on whether the chimney is to be built vertically or offset. For the roof penetration of the stainless steel chimney, the chimney diameter must be taken into account according to the given distance specifications. It is important to remember that the chimney must not be put into operation until the necessary approval has been obtained. Some consumers have their fireplaces installed and connected by a specialist. This creates the misconception that the fireplace can be used immediately. However, this is not the case. The regulations require a specific stainless steel chimney diameter. The guidelines of the individual federal states are different from each other. In addition to the walls, there are also certain distance regulations for other combustible components of the building. In order to ensure smooth approval by the chimney sweep, the components that are to be certified should also be as accessible as possible for the chimney sweep. This means that cavities which are difficult to access should be avoided if possible. If the building is adjacent to a forest or nearby, an increase in the electric spark protection is necessary. Possible problems such as a lack of smoke removal are often discovered by an expert during an inspection, as a result of an owner change. Also during a new assembly, an inadequate smoke removal of the stainless steel chimney can be identified. The reason for this is often a chimney that is laid too short. Design errors of this type can easily be used to corrected by using stainless steel chimney straight lengths. Stainless steel chimney length elements are also very inexpensive, so there is no need for the fear of high costs. Interested customers can get an overview in our chimney CC online shop before they decide to buy a stainless steel chimney kit. 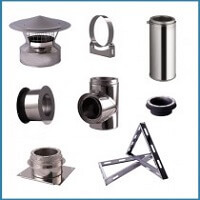 The range of stainless steel chimney systems made of high-quality stainless steel is versatile. 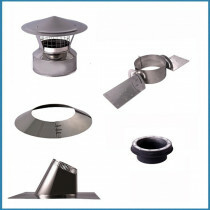 In addition to stainless steel chimneys of various diameters, our online shop also offers categorically fitting accessories, such as a matching stainless steel chimney rain cap. 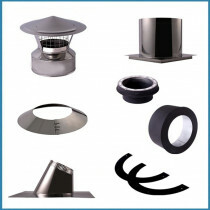 The rain cap protects all stainless steel chimney systems reliably against rainfall. In addition, expert support provides detailed advice to interested customers and even buy the chosen stainless steel chimney on request and deliver it to your home.